Tickets for the live event, which is promoted by Salita Promotions, are priced at $150, $100, $55 and $35 and are on sale Friday, March 1 at 11 a.m. ET. Tickets can be purchased through Ticketmaster and at boardwalkhall.com. Pre-sale tickets are available now at the link HERE by using the code BOXING. Also on Tuesday, SHOWTIME Sports announced that it will chronicle the buildup to Shields vs. Hammer with a two-part digital installment of the Sports Emmy® Award winning programing ALL ACCESS. ALL ACCESS: SHIELDS vs. HAMMER will premiere on March 29 with the second installment on April 5 on the SHOWTIME Sports YouTube channel and SHOWTIME Boxing Facebook page and take viewers into the training camps of both champions. Cameras will be embedded with Shields at the U.S. Olympic Training Center in Colorado Springs, Colo., and with Hammer in the town of Seefeld in the Austrian Alps as the undefeated rivals prepare for the most significant fight of their careers. “This has been long overdue. I’m just glad that Hammer is here and the fight is set. She’s been at my fights before but I can’t wait to get inside the ring and show her I’m the real champion. “I’ve traveled to many different countries and dethroned champions around the world. At the end of the day, I’m coming to fight and I recognize that she’s a great champion. To be a champion for all those years shows that she’s a good fighter. But I also look at resumes, and her resume is not as good as mine. “I’m not someone coming to lay down. I’m not afraid of her. You don’t win belts by talking. You have to fight. I said two years ago I want to fight Christina Hammer in my seventh fight. It would have been if it weren’t for her medical issue. But now we’re here and ready for April 13. “April 13 you’re going to see someone fold. I promise you, it will not be me. Make sure you all tune-in. “I think for women’s boxing this is a true super fight that we’ve never gotten before. We’ve never had a fight like this in women’s boxing. It’s great to make this happen and us being from two parts of the world makes this fight even better. “I’m very glad to be here and make this fight happen. I’m looking forward to April 13. I want to show the world who I am. “This is a big risk to come from Germany to the U.S., but I believe the best should fight the best and I did what I had to so that this could happen. This fight can be a game changer for our sport. “I will give everything to step out of the ring as a winner. I know Claressa Shields is also a great champion. She’s undefeated like me and that’s why people want to see the fight and that’s why we made it happen. “I want to thank everyone who made this fight a reality and brought us to this stage. It’s huge for me to be here in New York and I am looking to win on April 13. “This fight is the real deal. This is going to be a game changer for women’s boxing. I think we’re going to inspire a lot of female athletes who want to live their dream. It’s motivation for everyone. “I’ve had the title for a long time. I always push myself. This is the fight I wanted to show everyone who is the best. I will be the undisputed champion. “Shields is beatable. Hanna Gabriels caught her in the first round of their fight and I am taller and stronger than Gabriels. I want to finish the job if I get the chance. “I’m honored to bring to the fans the first super fight in women’s boxing history. A lot of questions surround this fight. Will this be a classic like Leonard vs. Hearns, where the gold medalist handles the experienced pro, or like Mosley vs. De La Hoya, where the boxing pro took the gold medalist down. This fight is going to be for all of the belts and this recognizes the true value and impact of this fight. “Christina Hammer has been a world champion for over nine years and has won titles in two divisions. She’s charismatic and a superstar in Germany and Europe. As a champion that she is, she’s traveling to the other side of the world to prove that she’s the best. “Claressa made the Olympic team when she was 17 years old, winning our only boxing medal at the 2012 Olympic games. She’s the only boxer in U.S. history to win two Olympic gold medals in boxing. She’s had a very impressive pro career, beating world champions and top contenders in all her fights. She’s on her journey to be the best and this fight is a big step toward cementing herself as the GWOAT (greatest woman of all time). “The media support for this fight is outstanding. This is a very special time. This fight is one of the most significant fights I’ve worked on in my career, because of the place it will hold in history. “Without the fighters wanting this fight, events like this wouldn’t happen. 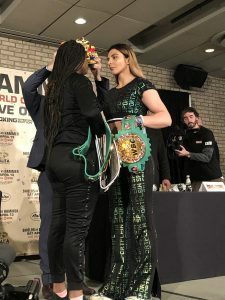 Christina Hammer wants this challenge and she wants to prove she’s the best middleweight champion out there. “These two fighters can be an example for a lot of male boxers. These are two undefeated fighters in their prime putting it all on the line to show who is the best. You don’t see that very often these days. “Let’s get one thing straight here. This isn’t just an important women’s fight. This isn’t just a high-quality women’s boxing match. This is a high-quality boxing match. This is an important fight. So certainly we have two very skilled women, we’re not going to ignore that fact. But this is one of the best fights that can be made in this sport. Two pound-for-pound boxers, the best fighting the best. If you are not interested in this fight, then candidly, you are not a boxing fan. This is as good as this sport gets. “We at SHOWTIME have a long history showcasing the best in women’s boxing and MMA. Names like Laila Ali, Christy Martin, Ronda Rousey, Miesha Tate, Gina Carano, Cris Cyborg. ; those are all fighters who made their debuts and that became stars on SHOWTIME. This has been a long-time commitment. “The first nationally televised women’s MMA event was on SHOWTIME. The first domestic televised MMA women’s main event was on SHOWTIME. The first women’s boxing match that was nationally televised was on SHOWTIME. The first women’s main event boxing bout was also on SHOWTIME, and that obviously was Claressa just a couple of years ago. “So here on this stage you’ve got two of the most elite athletes in the sport. Not two of the elite women’s fighters in the sport, but two of the elite athletes within this sport. Two-time gold medalist, the only American to do that consecutively, and a two-belt world champion versus a longtime middleweight champion who has dominated this division for nearly a decade. “We are so excited to have this great fight coming to Boardwalk Hall. It will be our first championship fight in several years and we can’t wait.